The first is that we have THREE Cat Cuddlers who pet, flatter and cuddle our kitty guests. Chris and Lara come every morning to murmur sweet encouragements and Nicole lives at the Resort and cuddles into the wee hours of the night. 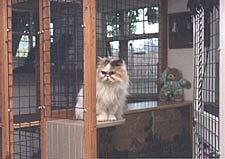 Owner/Architect Harriet Butts is the resort manager and general litter box specialist. Wendy Lafferty , the morning manager, has years of vet tech experience . Her calm, loving expertise helps lower Harriet's blood pressure daily. 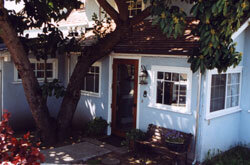 The second is that we provide private ROOMS for our kitty guests. Each walk-in-size room ( no cages & no condos! ) is unique with its own name, decor, window, and special features. They all vary but an average size is 6'X 5'X 8' high.